Beam today and make your shopping more rewarding! Did you ever thought of getting paid for downloading an App. Let me introduce you to Beam Wallet. Beam is a mobile app that changes the way you shop. In short you will be paying the bill using mobile App and you will be rewarded for that. Beam wallet is now offering signup bonus credit of 40 Aed for downloading the app. 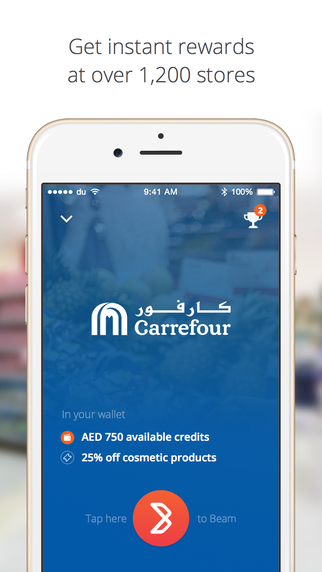 Credit can be redeemed at stores like Carrefour, VOX cinemas and all. You can increase your credit by referring your friends and both of you will get paid 40 Aed each. So why you are waiting, Beam today and make your shopping more rewarding! Step 1)Download Beam for iPhone and Android via the App Store or Google Play.